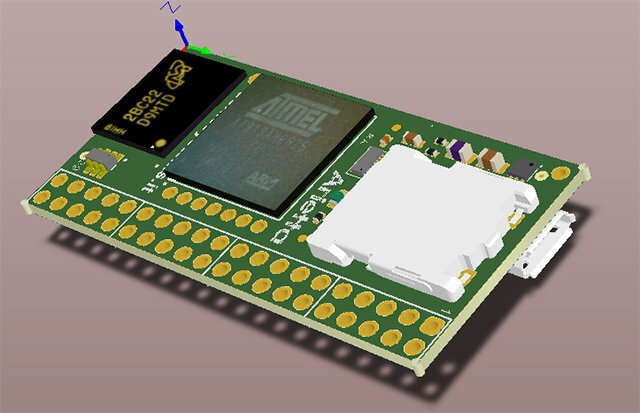 Acme Systems Aria G25 is a tiny system-on-module (SoM) based on Atmel SAM9G25 that sells for as low as 24 Euros. The company is now working on an smaller and lower cost ARM Linux module based on the same processor called Arietta G25. The board targets the hobbyist market and IoT (Internet of Things) applications. Since this is early stage of development, no documentation is available, but we do have some informations about Aria G25 support. You can build the latest Linux kernel (3.12.8 release, or 3.13r8) for the board, lots of tutorials are provided, including one explaining how to create an Embedded Debian Grip 7.2 image. The board is not open source hardware, but the company provides some hardware documentation. Finally, support is available via Google Groups. If you’ve been using a Raspberry Pi, or BeagleBone Black for your headless embedded project, but do not need much processing power, and/or need lower power consumption, Arietta G25 could be an option to consider. The only problem is that you’ll need to wait a little while, because the module will only ship in June 2014. The price will be 9.99 Euros for orders made before May 2014, and after the board will sell for a regular price of 19.98 Euros. The board will show up on Acme Systems eShop when it becomes available. Further information is available on the blog of one of Acme Systems’ owners (Roberto Asquini). Are there “real” USB connectors, or just pins? With real USB connectors it will be easy to connect a USB Wifi device for ethernet connectivity. Only pin. You’d have to solder you own things. You can see 7 pins right under Atmel CPU, that’s to connect a Wi-Fi module, but they did not provide details about the module yet. According the pinout on their blog, there aren’t any. But I’d assume some of the serial protocol pins (I2C, UART, SPI..) can also be configured as GPIO. (TBC). I’ll ask them. @cnxsoft On some SOCs, you can switch the role of each pin with a config file change in the bootloader or something. Anyway the USB pins are all brought out, so you have up to three USB host ports. we’ll offer a free on-line tools like this: http://builder.tanzilli.com:8080/. Connecting to builder.tanzilli.com|78.47.159.198|:8080… failed: Connection refused. It’s not working for me either, and I hadn’t tried at the time.